The OMB-DAQ-TC-RACK and OMB-DAQ-TC-RACK-EXP32 offer exceptional performance and accuracy for thermocouple measurement applications at a low cost per channel. Offering both Ethernet and USB ports, the OMB-DAQ-TC-RACK provides 32 channels of 24-bit resolution for medium channel installations. 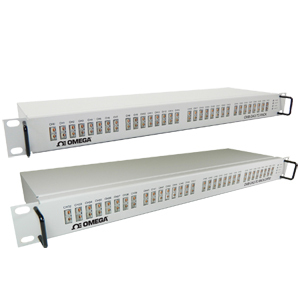 The OMB-DAQ-TC-RACK-EXP32 adds 32 high-precision channels to support larger installations. Accuracy is designed into the product with sigma-delta 24-bit ADCs, differential inputs, thermocouple-to-host isolation and cold-junction compensation (CJC) for each channel to reduce the effects of thermal gradients. With digital alarming notifications when a temperature exceeds programmed limits, the OMB-DAQ-TC-RACK and OMB-DAQ-TC-RACK-EXP32 offer the perfect solution for temperature monitoring applications including server rooms, refrigerated storage, and long-run test cells. These specifications apply to both the OMB-DAQ-TC-RACK and OMB-DAQ-TC-RACK-EXP32 unless noted otherwise. When thermocouple sensors are connected to different common mode voltages, the channels with floating thermocouples sensors are biased to approximately the average value of the applied common mode voltages. Each of the applied common mode voltages must then be less than or equal to the average common mode voltage ±1.40 V or [CMVapplied = (CMVaverage ±1.4 V)]. Thermocouple (J, K, T, E, R, S, B, N): 32 differential channels Channel configuration is stored on EEPROM external to the isolated microcontroller by the firmware whenever any item is modified. Modification is performed by commands issued from an external application, and the configuration is made nonvolatile through the use of the EEPROM. Nota: Comes complete with 1 m (3.2') CAT-6 Ethernet cable, 1.8 m (6') USB cable, TracerDAQ software and operator’s manual on CD.